The epithelioid blue nevus (EBN) is considered a cutaneous marker of the Carney complex. Sporadic EBN has been reported in patients not exhibiting the Carney complex. The EBN does not exhibit unique clinical features that help to differentiate it from other lesions and is often provisionally diagnosed as an acquired melanocytic nevus, or a malignant melanoma. A 52-year-old African-American female had a 3-4 mm bluish macule of the left anterior hard palate. An excisional biopsy was performed to rule out an incipient melanoma. Formalin-fixed, hematoxylin and eosin-stained sections were examined microscopically. On the basis of histopathological features, a diagnosis of EBN was rendered. We document a case of the rare EBN affecting the oral mucosa. The patient did not exhibit any features associated with the Carney complex. Two years post-operatively, there is no evidence of a recurrent tumor. Histologically, the blue nevus is classified as either common or cellular blue nevus. , In 1996, Carney and Ferreiro  described the epithelioid blue nevus (EBN) in patients with Carney complex, an autosomal dominant syndrome characterized by macular skin pigmentation, cardiac, cutaneous and soft tissue myxomas, endocrine overactivity and psammomatoid melanotic schwannomas. Sporadic cases of the EBN have been reported in patients not exhibiting the Carney complex , and, to our knowledge, only one case has been reported to date in the oral cavity. We document a case of the rare EBN affecting the mucosa of the hard palate. The patient did not exhibit any features associated with the Carney complex. A 52-year-old African-American female presented for a routine dental examination. During the examination, a 3-4 mm bluish macule of the left anterior hard palate was noted. The patient's medical history was significant for insulin-dependent diabetes mellitus. The diabetes was adequately controlled and she was otherwise in good health. The presence of the palatal lesion had been unknown to the patient. A working diagnosis of melanotic macule was given. An excisional biopsy was performed to rule out incipient melanoma. Routinely processed, formalin-fixed, hematoxylin and eosin-stained sections were examined. Microscopic examination showed a proliferation of pigmented tumor cells within the submucosa. A relatively clear grenz zone of connective tissue separated the tumor from the overlying epithelium. The tumor was neither encapsulated nor circumscribed. However, it did not demonstrate an infiltrating or penetrating periphery. Pigment production was most prominent among the superficial tumor cells, with those in the deeper tissues showing reduced intracytoplasmic pigmentation [Figure 1]. Upon closer examination, the epithelium did not demonstrate any nevomelanocytic activity among the basal cell layer or above. 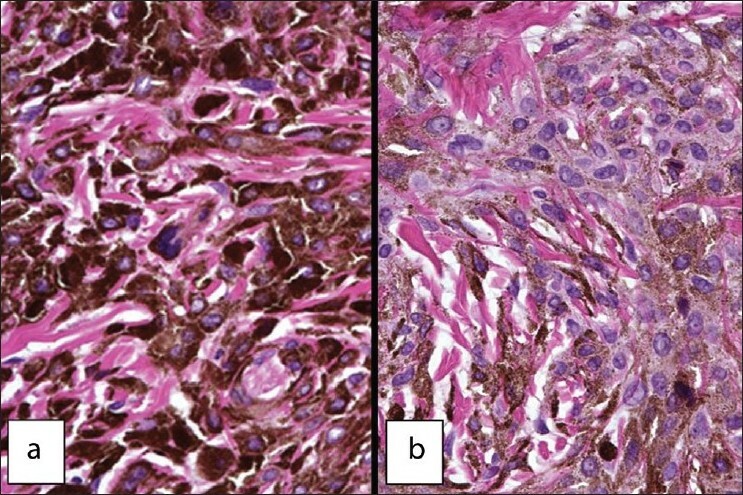 The heavily pigmented tumor cells were arranged in strands and sheets interspersed by thick bands of collagen. While the pigment-producing large cells were largely obscured by the intracytoplasmic melanin, their nuclei remained fairly prominent [Figure 2]a. Cells in the deeper portion of the tumor showed a reduction in the amount of melanin produced. This reduced tinctorial intensity revealed the epithelioid morphology of the cells with abundant amphophilic cytoplasm. The cytoplasmic membranes were indistinct. The nuclei showed intranuclear vacuolation with occasional pinpoint nucleoli [Figure 2]b. Mitotic activity and pleomorphism of the cells was not seen. No clusters or a "theque-like" arrangement of tumor cells was noted. On the basis of these histopathological features, a diagnosis of EBN was rendered. As the lesion was excised, no further intervention was necessary. Further, the patient did not exhibit features associated with the Carney complex. Almost 2 years post-operatively, there is no evidence of a recurrent tumor. The EBN is considered a cutaneous marker of the Carney complex. However, since the original description,  patients have been identified with EBN and no evidence of the Carney complex. In these cases, the diagnosis of an EBN was established only upon microscopic examination of the biopsied tissue. The only other case of an intraoral EBN was described as a dark blue, firm, sessile mass of the left buccal mucosa measuring 4x3 mm. The tumor in our patient measured approximately 3 mm in diameter. It presented as a bluish macule of the left anterior hard palate and was provisionally diagnosed as a melanotic macule. Apparently, intraoral EBN may present as a nodule or a macule with bluish coloration. The clinical differential diagnosis therefore includes acquired melanocytic nevi, the common and cellular blue nevi, Spitz nevi, melanotic macule, melanoma, amalgam and graphite tattoo, pyogenic granuloma, vascular anomalies and varices and the peripheral giant cell granuloma. An excisional biopsy followed by histopathological examination of the tissue is required to arrive at a final diagnosis. Histopathologically, the EBN requires differentiation from other tumors like the benign melanocytic nevi, the common and cellular blue nevi, the Spitz nevus and malignant melanoma. Unlike these aforementioned nevi, the EBN demonstrates no junctional activity. The nevus cells are uniformly epithelioid throughout the lesion and there is no significant mitotic activity. Also, the cells do not tend to cluster in theques. Individual or groups of cells may be separated by a collagenous stroma but zonation, as seen in the cellular blue nevus, is not seen. Unlike the previous description of the intraoral EBN,  our case exhibited a reduction in the amount of pigment produced in the deeper portions of the tumor. The EBN lacks junctional or pagetoid activity, cellular pleomorphism, or significant mitotic activity. Although it is unencapsulated and not circumscribed, it is symmetrical in appearance. These features help differentiate the EBN from a potential melanoma. As EBN seldom measure more than a few millimeters in size, an excisional biopsy is curative. Further, a careful assessment of the patient should be carried out to exclude the possibility of the Carney complex. We document a case of an EBN of the oral mucosa in a 52-year-old patient with no evidence of the Carney complex. Following an excisional biopsy, there is no evidence of recurrence after 2 years. The diagnosis was established only after histopathological examination of the biopsied tumor tissue. 1. Elder DE, Murphy GF. Melanocytic tumors of the skin. Atlas of tumor pathology, 3 rd series, Fascicle 2. Washington DC: AFIP; 1991. p. 57. 2. Piana S, Asioli S. Blue nevus of the nasal mucosa. Virchows Arch 2005;446:342-3. 3. Izquierdo MJ, Pastor MA, Carrasco L, Moreno C, Kutzner H, Sangueza OP, et al. Epithelioid blue nevus of the genital mucosa: Report of four cases. Br J Dermatol 2001;145:496-501. 4. Buchner A, Hansen LS. Pigmented nevi of the oral mucosa: A clinicopathologic study of 36 new cases and review of 155 cases from the literature: Part II: Analysis of 191 cases. Oral Surg Oral Med Oral Pathol 1987;63:676-82. 5. Flaitz CM, McCandless G. Palatal blue nevus in a child. Pediatr Dent 2001;23:354-5. 6. Buchner A, Merrell PW, Carpenter WM. Relative frequency of solitary melanocytic lesions of the oral mucosa. J Oral Pathol Med 2004;33:550-7. 7. Crowson NA, Magro CM, Mihm MC. The melanocytic proliferations: A comprehensive textbook of pigmented lesions. New York. Wiley-Lis; 2001; p. 97. 8. Carney JA, Ferreiro JA. The epithelioid blue nevus. A multicentric familial tumor with important associations, including cardiac myxoma and psammomatous melanotic schwannoma. Am J Surg Pathol 1996;20:259-72. 9. O'Grady TC, Barr RJ, Billman G, Cunningham BB. 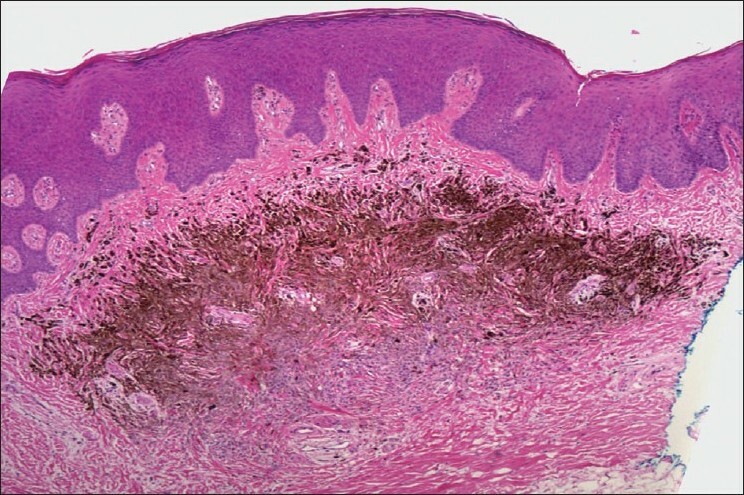 Epithelioid blue nevus occurring in children with no evidence of Carney complex. Am J Dermatopathol 1999;21:483-6. 10. Pinto A, Raghavendra S, Lee R, Derossi S, Alawi F. Epithelioid blue nevus of the oral mucosa: A rare histologic variant. Oral Surg Oral Med Oral Pathol Oral Radiol Endod 2003;96:429-36. 11. Neville BW, Damm DD, Allen CM, Bouquot JE. Oral and Maxillofacial Pathology. W.B. Saunders Company; 2 nd ed.2002. p. 334-6. 12. Zembowicz A, M0 ihm MC. Dermal dendritic melanocytic proliferation: An update. Histopathology 2004;45:433-51.
de Barros, J.A. and Kafler, C.C. and de Barros, J.C. and Proto, R.S. and Costa, P.S. and Filho, C.D.M.